CorbettTourism.com offers you cheap and best deal to enjoy Elephant Safari Online Booking inside and outside of Corbett National Park. Visitors can book online Elephant Safari for Three different zones of forest namely Bijrani zone, Dhikala zone and Corbett Landscape zone ( Sitabani Wildlife Reserve ). Price (Indian) : INR 3500 Elephant ( Maximum 4 Persons are allowed in ONE Elephant ). Price (Foreigner) : INR 4500 Elephant ( Maximum 4 Persons are allowed in ONE Elephant ). Zone : Dhikala Zone, Bijrani Zone and Corbett Landscape Zone. Visitor Season : 15th November to 15th June | Corbett landscape Zone : Round the year. Timings : Summer Season : 6:00 AM to 8:00 AM and Evening : 3:30 AM to 5:30 PM. Timings : Winter Season : 7:00 AM to 9:00 AM and Evening : 2:30 AM to 4:30 PM. 1. Elephant Safari is NOT booked in advance for Corbett Tiger Reserve Zone. Its booked on SPOT and subject to availability. 2. 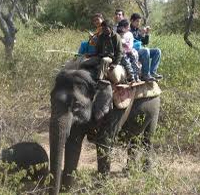 For Elephant Safari, one has to avail Jeep Safari to reach inside Bijrani Zone. 4. Visitors Will Be Responsible for own Luggage in Safari ( Elephant living ) Timing or If you loss any thing in safari ( Elephant living ) timing we are not Responsible. 5. Elephant safari will book in advance basis. Booking starts 45 days prior to your tour date. 6. As per jungle safari regulations, once confirmed and booked, the booking amount of Elephant Safari is Non-refundable, Non-repalceable and non transferable.